From the age of ten, looking up at the stars, Jerry Ross knew that he wanted to journey into space. 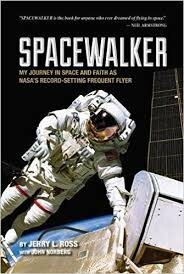 This autobiography tells the story of how he came not only to achieve that goal, but to become the most-launched astronaut in history, as well as a NASA veteran whose career spanned the entire US Space Shuttle program. For readers who have followed the space program from Mercury through the International Space Station and wonder what comes next, this book provides fascination; for young people interested in space exploration and reaching for their dreams, whatever they might be, this book provides inspiration.